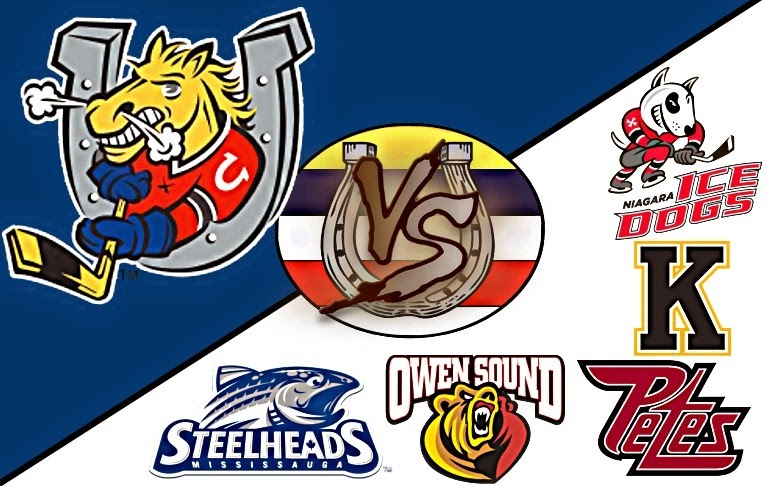 The @OHLBarrieColts Final 5 Games of the Regular Season. #OHL - Very Barrie Colts | A website covering the Barrie Colts of the OHL. The Colts are down to the final 5 games of their regular season. They currently sit in second place in the Eastern Conference. If the season ended today (which sadly, it doesn't) Barrie would be facing the Belleville Bulls in the first round of the OHL playoffs. The Bulls also are likely hopeful the season ended today because that would mean they have a guaranteed spot in the playoffs. Though with a 5 point lead over Mississauga, (the only team that could take their spot) it doesn't appear that they are in any jeopardy of losing that spot. That doesn't mean it cant happen. The Colts on the other hand, though have had a clinched playoff spot for a while could end up finishing anywhere from second in the East to as low as 5th. Still in a battle with North Bay for top spot in the Central Division, the Colts are in a very tight spot for that number 2 spot. The Colts have a 3 point lead over the Battalion with a game in hand. Niagara only needs 5 points to also jump the Colts in the standings. What is scary is that they are currently riding a 6 game win streak and have a 8-2-0-0 record in the last 10 games.. The Colts have lost their last 3 straight and have only won 4 games in their last 10. Here is a look at the race in the East. Here is a look at the Colts final 5 opponents of the regular season. Owen Sound - Barrie has met the Attack 5 times this season and have 1 more match-up this year in the regular season. Owen Sound has won 3 of the 5 meetings and have outscored Barrie 16-10 in those games. Owen Sound has clinched a spot in the West already but currently are fighting to catch Guelph for that number 4 spot to obtain home ice in the first round of the playoffs. Mississauga Steelheads - Barrie has met Mississauga 5 times this season and have won all 5 meetings. They have out scored the Steelheads 24-10 in those games. Mississauga sits in 9th place in the East and trail Peterborough by 5 points. Though it won't be easy for the fish to get that final spot it is still possible and a win over a team like Barrie that has dominated them all year could give them more motivation headed into the final stretch. Peterborough Petes - This is the 4th and final meeting of the regular season between these teams. The Petes have won 2 of the 3 previous meetings but have been out scored by the Colts 13-12. Peterborough is in a fight right now with Mississauga biting (do fish bite?) at their heels while hoping to catch up to the Bulls for that 7th spot in the East. Niagara IceDogs - This will be the final meeting of 6 this season between these teams. Niagara sits in 5th in the East right now and can either gain leverage in the standings or drop. They have had the edge this season against the Colts winning 3 of 5 meetings and for the most part it has been a tight season series. The IceDogs have been really hot as of late and no doubt will be hungry to end the season series the winning team headed into the playoffs. Kingston Frontenacs - this will be the 4th meeting of the season and the final game of the season for the Colts. Colts will be looking to sweep the Fronts 4-0 and have clearly been the stronger team in the previous meetings. None of these games will be easy points. And each game has points up for grabs that are very important. The Colts really need to play strong if they want to keep that second spot in the East. We will provide a better look into each of these games on the day of each match up. One thing is for sure, The Colts are in the Playoffs. That is just the first part of the battle. Winning these games could help them with home ice advantage throughout the playoffs as well as a better position for the first round. How do you like the Colts chances headed into the final 5 games of the season? Let us know in the comments, on our Facebook Page or on Twitter!